I have always loved a nice bowl of soup. It can have the ability to transform your mood or make you feel instantly better when you are under the weather. 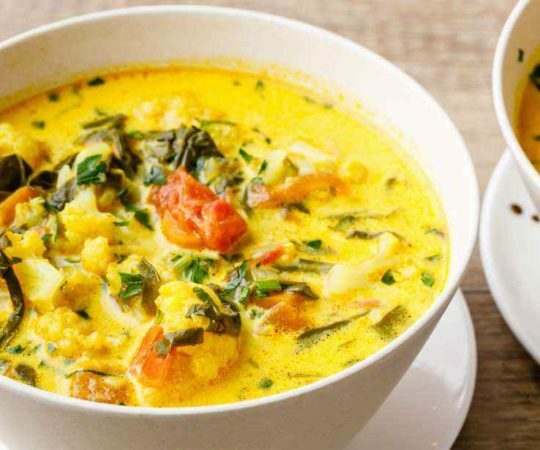 The coconut milk in this recipe combines nicely with the curry to make a sweet and comforting soup. 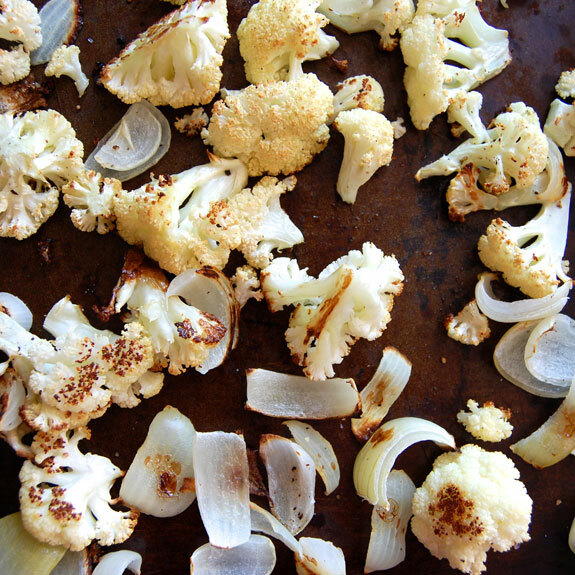 The curry adds a beautiful depth of flavor, as does the roasted cauliflower. 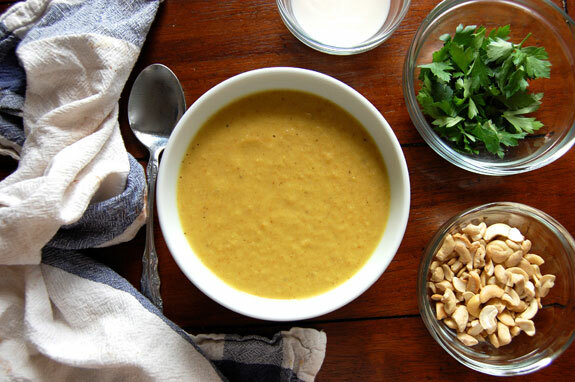 This lightly-spiced cauliflower soup is warming and delicious. 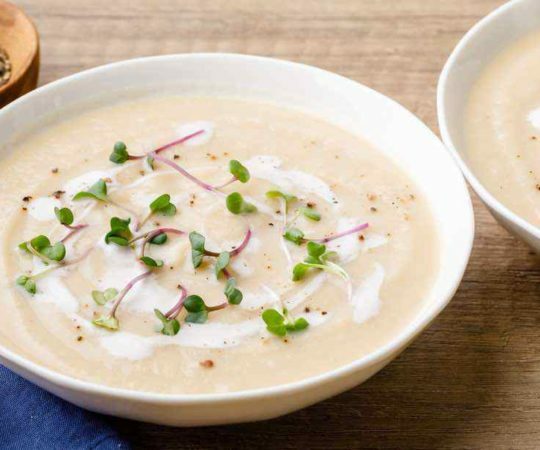 Cauliflower soup is very simple and affordable. I didn’t intentionally start eating a mostly vegetarian diet, but it has turned out to be so. 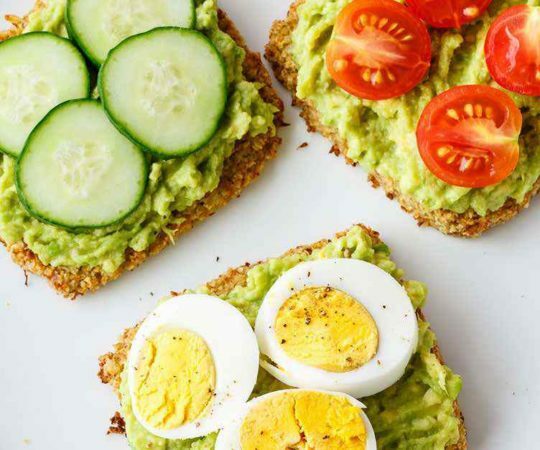 When I moved to the city and meat became much more expensive than I was used to, I found myself gravitating toward veggies more and more. And cauliflower has become a staple, mainly because one head of cauliflower can stretch over a few meals, and because it fills me up. Versatile and easy to prepare, cauliflower is a regular in my kitchen now. I turn to cauliflower a lot more in the winter, partially because many other fresh vegetables are all out of season, and partially because it’s so hearty and comforting. 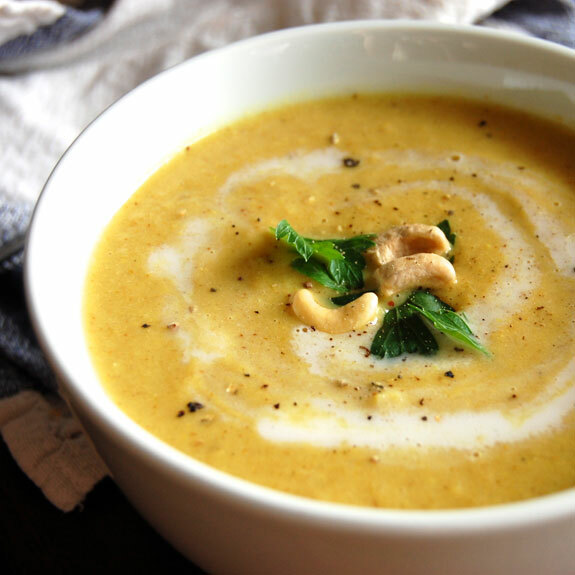 This isn’t one of those soups that are best served as an appetizer; rather it has a lot of substance and is satisfying as a meal on its own. This soup is perfect for a cold blustery day, when you are look for some hot food to keep your insides warm. It’s also not too heavy, which is a welcoming aspect for post-holiday meals. 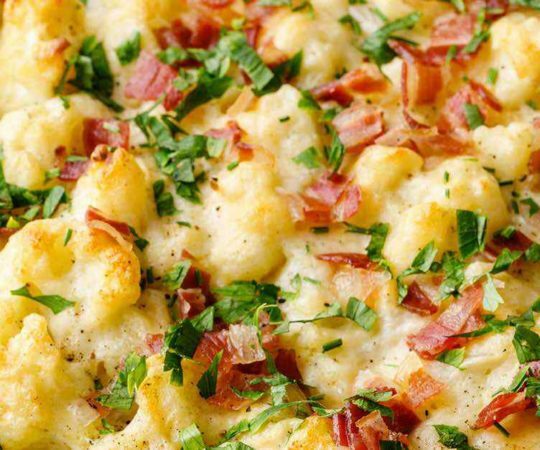 Preheat the oven to 375 degrees F. Spread out the onion and cauliflower in a single layer on a baking sheet. Drizzle with olive oil and sprinkle with salt and pepper. Roast for 15-20 minutes until golden, stirring once. Using an immersion blender, puree ingredients in the pot until smooth. (Alternatively, carefully transfer to a blender.) Stir in the coconut milk and warm the soup to serve. Taste to adjust seasonings as necessary. 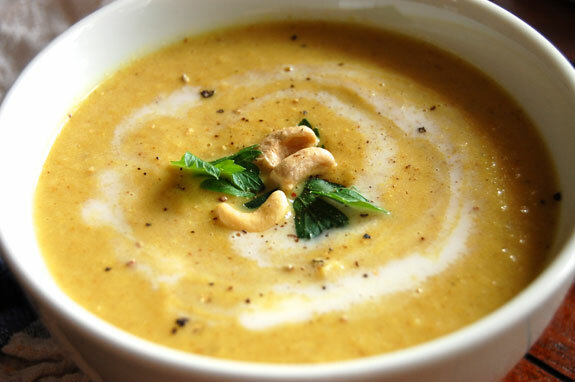 Serve with roasted cashews and top with parsley. I agree that this recipe could use more seasonings, next time I shall try the garlic and more seasonings! 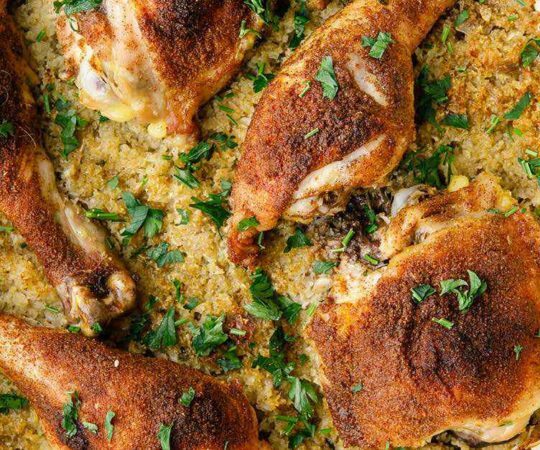 a very easy and quick meal for a weeknight dinner. I added 1/2 tsp of curry powder because otherwise, this didn’t feel or taste like a curry soup. Absolutely enjoyed this recipe just as it is. 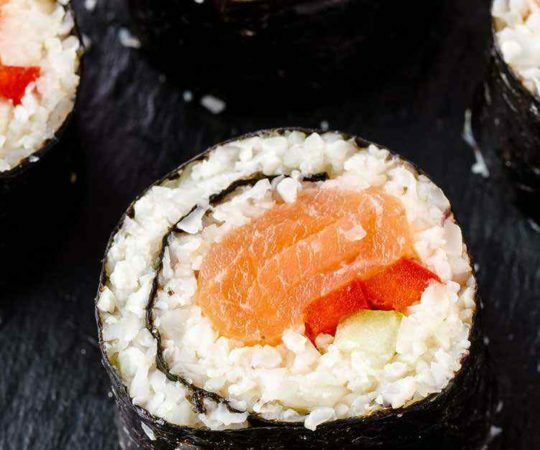 It was easy to prepare and easy to enjoy! I added garlic, curry powder, a little fennel, and a little cilantro (I didn’t think I had coriander…found it after I’d subbed the cilantro, then decided to add it, too!). I also didn’t have an onion so I roasted some celery with the cauliflower instead. Delicious! Where do I find full fat coconut milk? Is this a refrigerated item? I am preparing to start my first Paleo week…. You can find full fat coconut milk in the asian section of the market. It comes in a can and is not refrigerated. Is chicken stock paleo? I am confused. Is there something that I could sub for the coconut milk? I’m not a fan of coconut flavor. So delicious! I could eat this for breakfast, lunch, and dinner!